Unless you’re like me and have been riding your bicycle throughout the winter, you’re probably thinking right about now that it’s high time to get your wheels out. 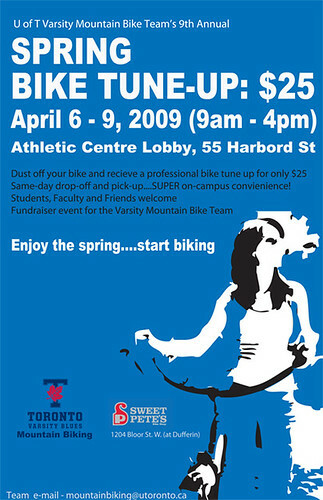 Conveniently, the U of T Mountain Bike Team is having a spring bike tune-up fundraiser! Get ready to get fit, increase your vitamin D intake, and cruise past the suckers stuck in traffic!